You probably know how I’m interested in human geography, in particular how cities are born, grow, and change over time. 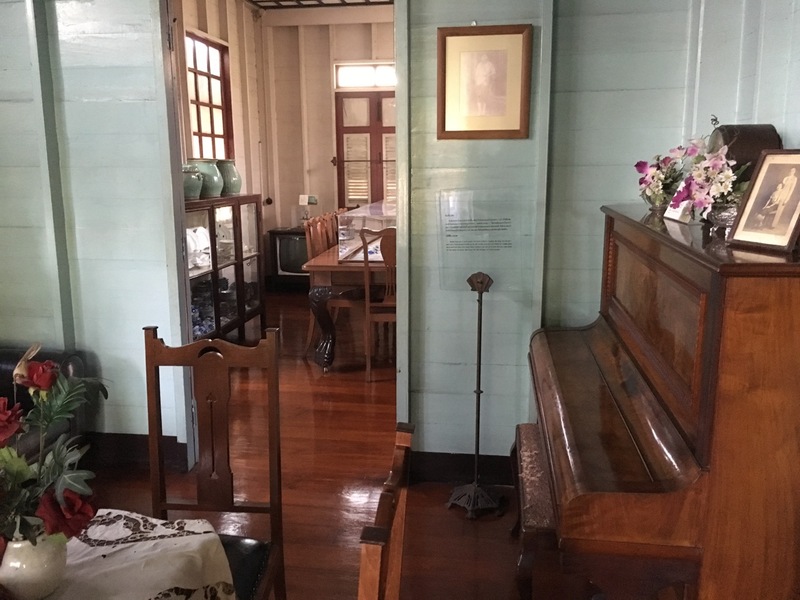 So I was psyched to learn that Bang Rak, the part of Bangkok where we’ve been staying, has its own little history museum. 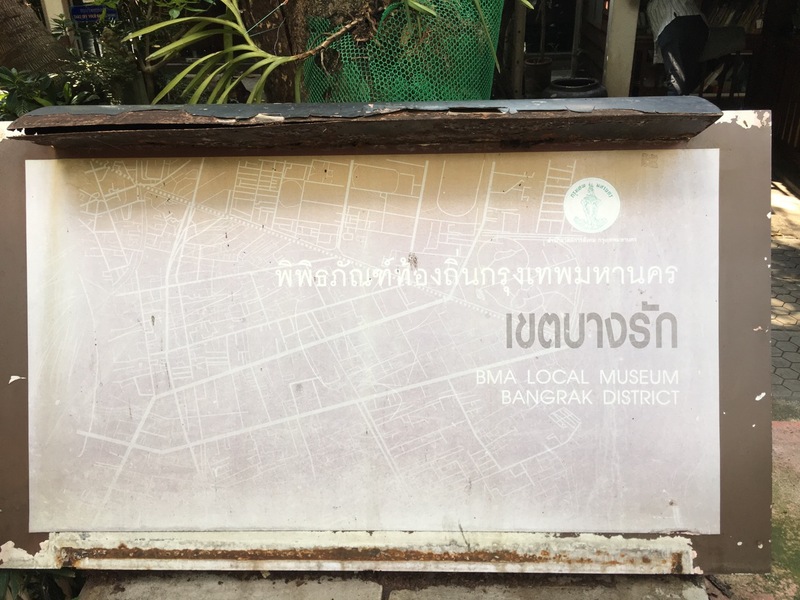 It was a bit confusing at first, because I found three different names for this museum: the Bangkok Folk Museum, the Bangrak Museum, and the Bangkokian Museum. It turns out those refer to slightly different things. 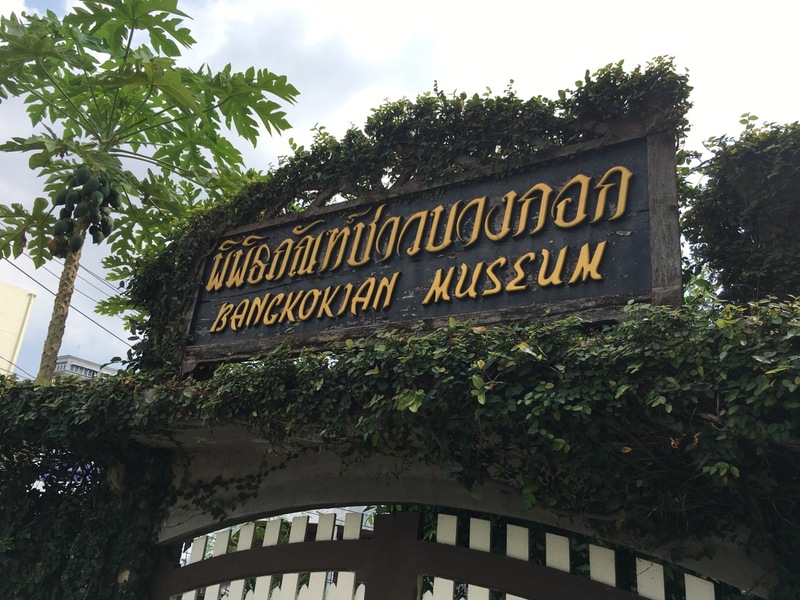 The Bangkokian Museum is another name for the Bangkok Folk Museum. And one floor of one of the buildings of the museum is the Bangrak Museum. They all have free admission, are in the same location, and apparently share the same volunteer staff. My knee has been hurting since I twisted it getting onto the long tail boat to go see James Bond Island the week before, so Beth and I were trying to minimize the amount of walking I did. To that end, we took the river bus (what they often erroneously call a “river taxi” around here) north a couple of stops and got off there, to shorten our walk. On the way out of the pier area, we passed the Portuguese embassy, and then walked through this area of really expensive art stores. That included a statuary, and one of the statues caught my eye in particular. Most of them were things that looked like some rich Bangkok family might have in front of their house – a religious or historical figure, or a fountain, or a Greek god or something. 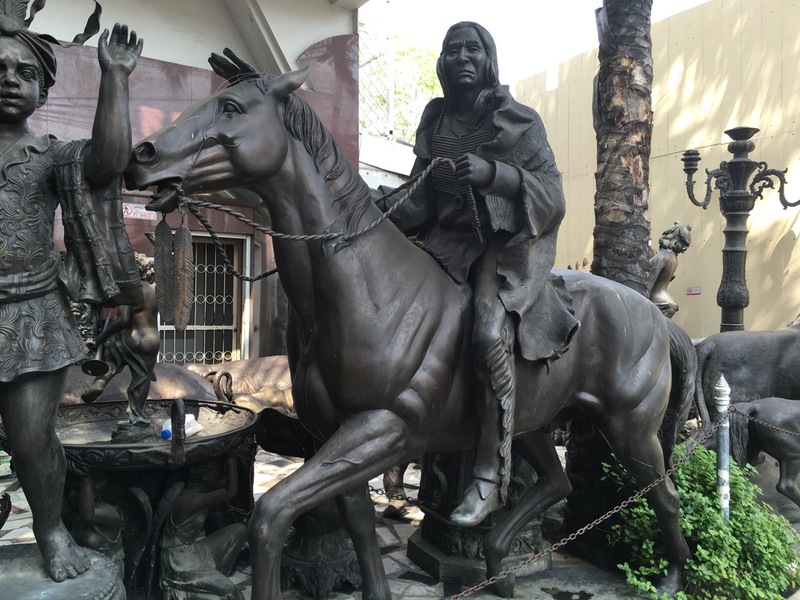 But this one was definitely a Native American on horseback. I guess there must be some market for this sort of thing in Thailand, which for some reason surprised me. We walked a ways farther and found underneath the elevated expressway is a sort of holding facility for all kinds of stuff related to garbage removal. There were dozens of garbage trucks, mostly in new or near new condition. 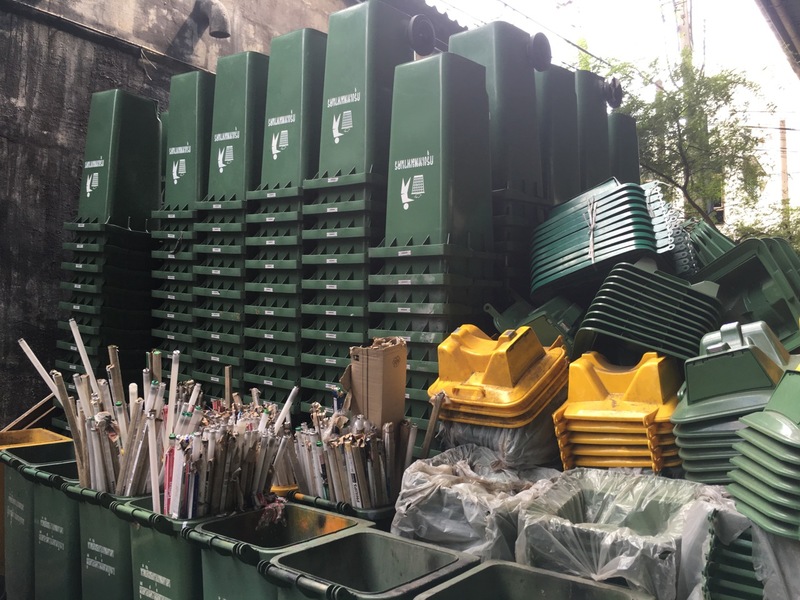 There were piles and piles of garbage bins and recycling bins. We even found some piles of large wicker baskets that I think are for collecting and removing recyclables. In the photo above, you can see they have a big pile of those long fluorescent bulbs, hopefully being stored here until they can be properly disposed of. Beth loved it and took about six thousand photos. Once we continued on, it wasn’t much farther to the museum. I spotted the gate leading to the museum and soon encountered the security guard. As soon as he could see us coming down the street, the guard came out to the gate and started waving me on, like “You found us! Come in!” This museum is way off the beaten path for tourists. He proudly displayed the guest book, which I signed. We were only the sixth group of visitors for the day, and the only from the USA. Just in case the security guard excitedly waving us in wasn’t enough of a clue, this sign made it clear we found the museum. I read somewhere the Bangkok Metropolitan Administration (BMA), which is the city government of Bangkok, had a problem to encourage this sort of small museum in various districts around the city. 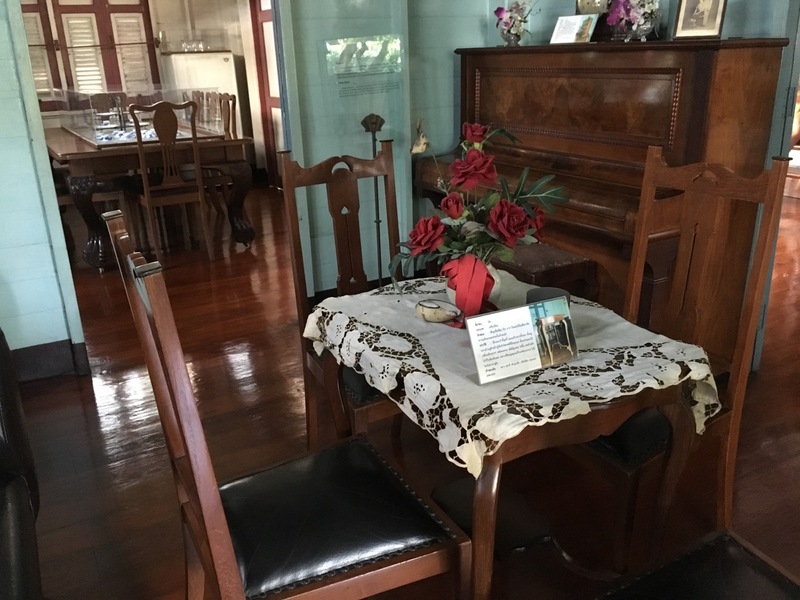 In fact, this museum may have been the first one of the BMA Local Museum program. Here is the faded sign. A volunteer greeted us, gave us a brochure in English, explained briefly that there are three buildings here, and made it clear that we are to remove our shoes as we enter each one. But I’ll say that we saw art, and lots of furniture and other home items that were in common use in the first half of the 19th century. 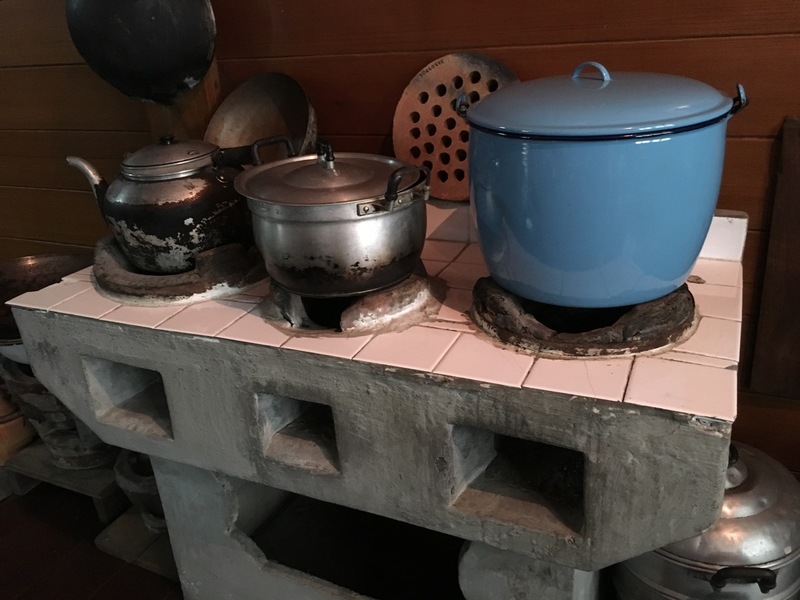 The theme of the museum is sort of a slice of life of what it was like for a middle class Bangkok family in the Bangrak district from the 1920s to the 1950s (and in some cases a little beyond). A lot of the stuff, like this furniture, reminded me of my grandparents’ furniture in the western United States. But the kitchen and cooking stuff was definitely different, like these tiffins. 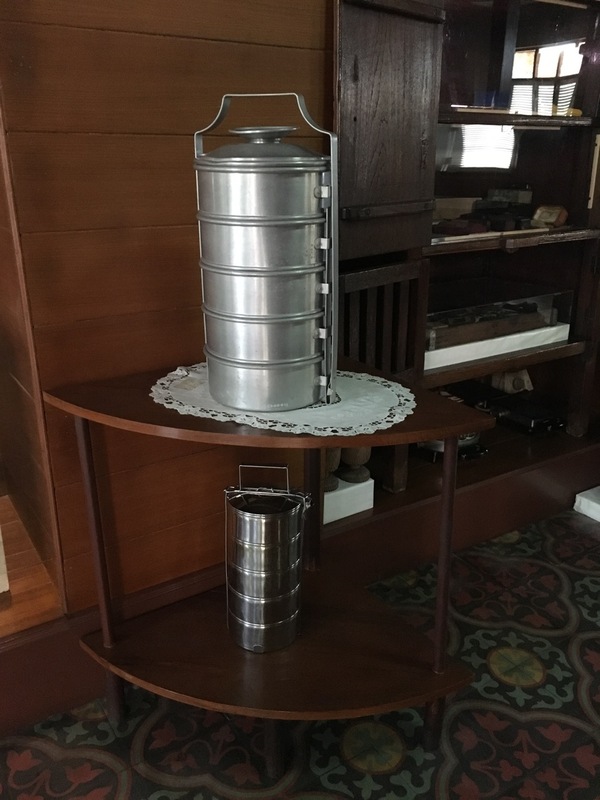 I’d known tiffins were an Indian thing, but I guess they were (are?) used in Thailand, too. I don’t think I’ve ever seen anyone with one of these in Bangkok. 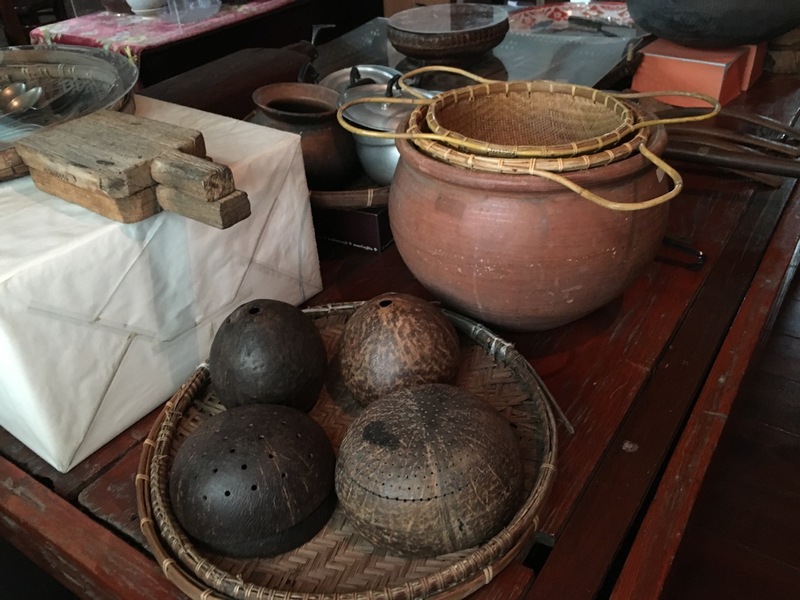 These coconut shells are actually low tech kitchen shells. If you put one in a bowl of water, it sinks at a given rate depending on how many holes it has. when the shell is totally submerged, then the time is up. 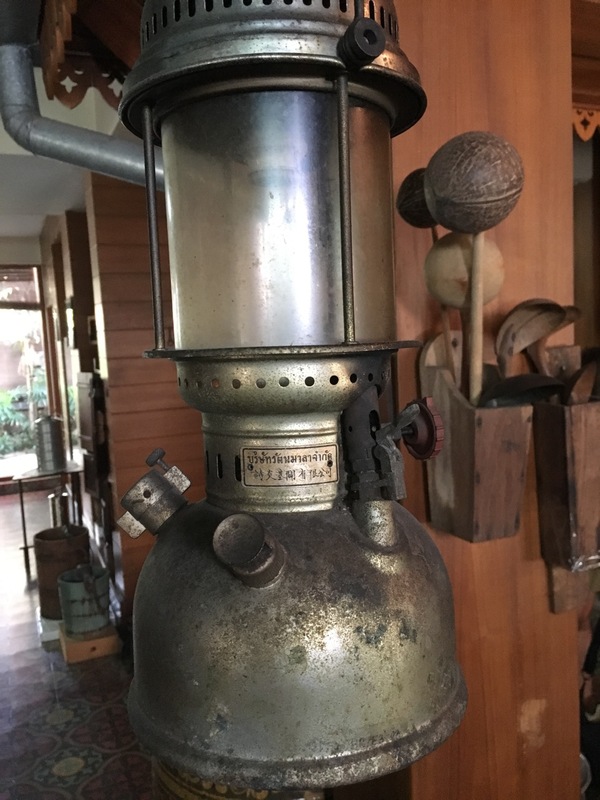 Before gas or electric, here’s what Thai kitchen stoves looked like. Light was provided by what I’d call a “Coleman” lantern. 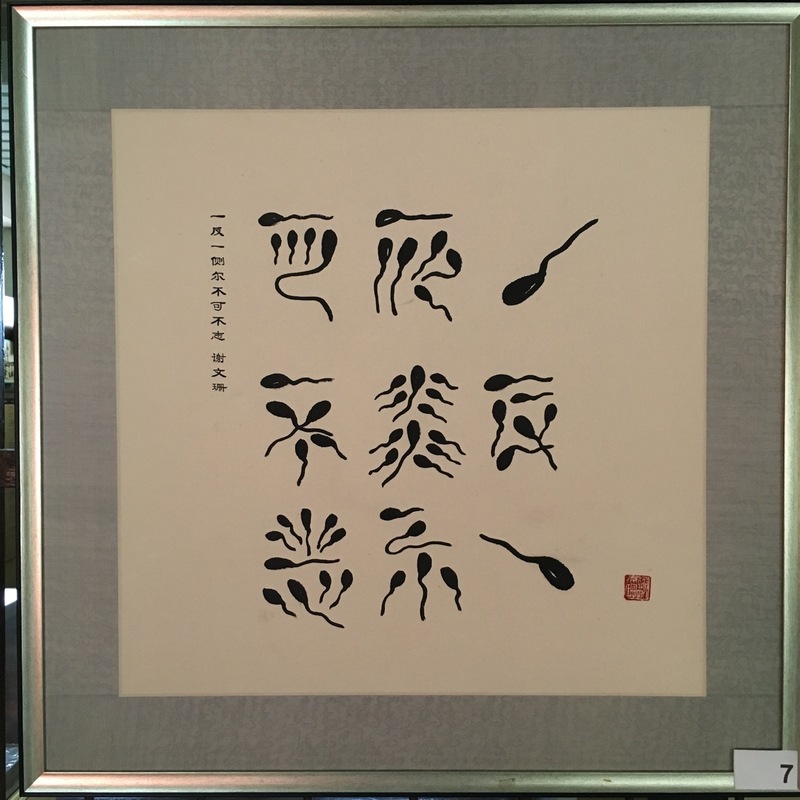 Interspersed in the old stuff in the museum were some art exhibits, including one of these Japanese style paintings that use “tadpole writing”. If you could read Japanese, I don’t know if this would mean any more than it means to me, which is almost nothing. The Bangrak Museum, which was the main thing that I wanted to see, was probably the least impressive. There were a lot of photos and some written descriptions, but almost all of it was in Thai, with no English translations. So we just had to guess at what we were seeing. I can tell you some of the photos were showing how the Bangrak streets looked 50 years ago and now in modern times. Some of them showed the old canals and farmland that was back then. Most of the photos hadn’t been enhanced in any way, and many were printed on colored card stock. So that made them even harder to understand, and almost pointless to photograph. So I didn’t take any pictures of this museum. I’m sad to say this part was a let down. The greatest praise I can give is that it’s in the one building that has air conditioning. Once we finished the Bangrak Museum, we used the restroom, made a hefty donation to go to the maintenance of the museum, and then walked back to our hotel. This part of town is now heavily Muslim, so we found and ate at a Middle Eastern restaurant. I was too busy enjoying the delicious hummus to take any photos. Sorry. Oh, and the kebabs were outstanding.